The markets globalization erased commercial boundaries and increased the competitiveness of companies all around the world. This competitiveness has forced companies to improve their processes and operations, as well as, their management relationships with suppliers and customers. Emerging from this progress, several needs led to the development of Lean Production (LP) – which proved to be effective in the waste reduction and efficient in providing production flexibility. Through its implementation, LP allows the increase of workers’ involvement, their safety and health. 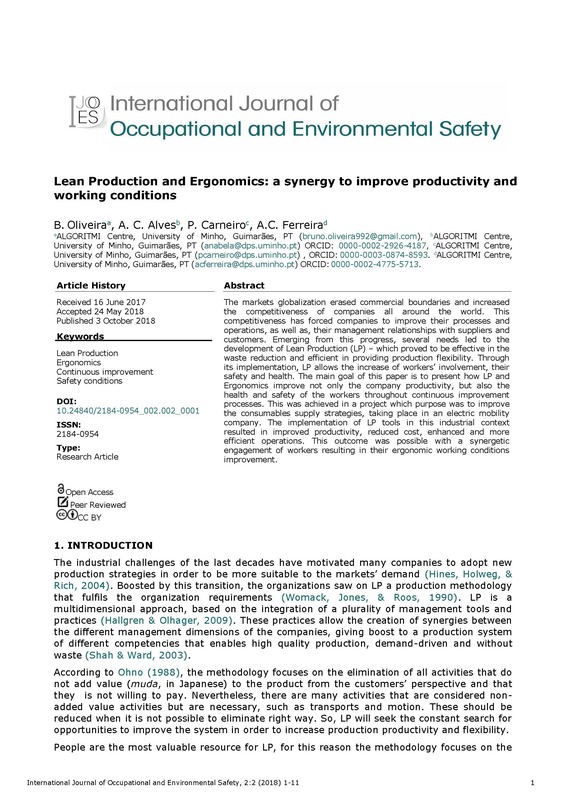 The main goal of this paper is to present how LP and Ergonomics improve not only the company productivity, but also the health and safety of the workers throughout continuous improvement processes. This was achieved in a project which purpose was to improve the consumables supply strategies, taking place in an electric mobility company. The implementation of LP tools in this industrial context resulted in improved productivity, reduced cost, enhanced and more efficient operations. This outcome was possible with a synergetic engagement of workers resulting in their ergonomic working conditions improvement. The need to improve the safety management in the maintenance and operational works on a motorway is a request that all the organizations demand to achieve better goals on safety and in the use of resources. The use of instruments linked to efficiency and effectiveness is one possible solution to this problem. The objective of the present investigation is to prove that it is possible to identify the main activities contained in the A area of an ABC curve and linked to the Pareto´s concepts, defining this way the 20% most dangerous maintenance and operational activities on motorway works. The methodology used was a DELPHI panel formed by experts from different areas linked to safety at work on motorways. The statistic treatment was made through the informatic program IBM SPSS Statistics 24. The results show that it is possible to identify 36 main activities in maintenance and operational works, being relevant the activities related to emergency response, safety guards, expansion joints, provisional signaling and the access to working stations in toll areas. The conclusions of the study reveal that these 36 activities represent the 20% most dangerous activities in maintenance and operational works on a motorway, and show that besides the risks of the work itself, there are four crucial traffic factors to develop a correct risk analysis: weather conditions, traffic characteristics, pavement characteristics and motorway morphologic type. Striving to improve productivity, industries have used different management approaches, being lean manufacturing the most used over recent years. Lean manufacturing is based on value creation for the customer and elimination of waste that occurs during the production process, while improving working conditions. The incorporation of ergonomic aspects in the workstation design also contributes for the referred objectives, since it will reduce awkward postures or excessive effort during work, leading to better working conditions and increased productivity. 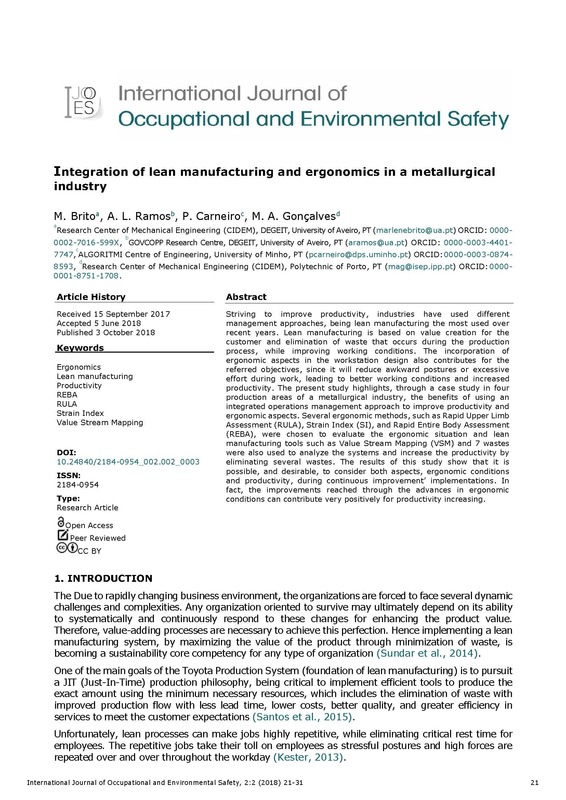 The present study highlights, through a case study in four production areas of a metallurgical industry, the benefits of using an integrated operations management approach to improve productivity and ergonomic aspects. Several ergonomic methods, such as Rapid Upper Limb Assessment (RULA), Strain Index (SI), and Rapid Entire Body Assessment (REBA), were chosen to evaluate the ergonomic situation and lean manufacturing tools such as Value Stream Mapping (VSM) and 7 wastes were also used to analyze the systems and increase the productivity by eliminating several wastes. The results of this study show that it is possible, and desirable, to consider both aspects, ergonomic conditions and productivity, during continuous improvement’ implementations. In fact, the improvements reached through the advances in ergonomic conditions can contribute very positively for productivity increasing. Work organizations rapidly change, triggering the need for a dynamic approach regarding the occupational health and safety and accident prevention. 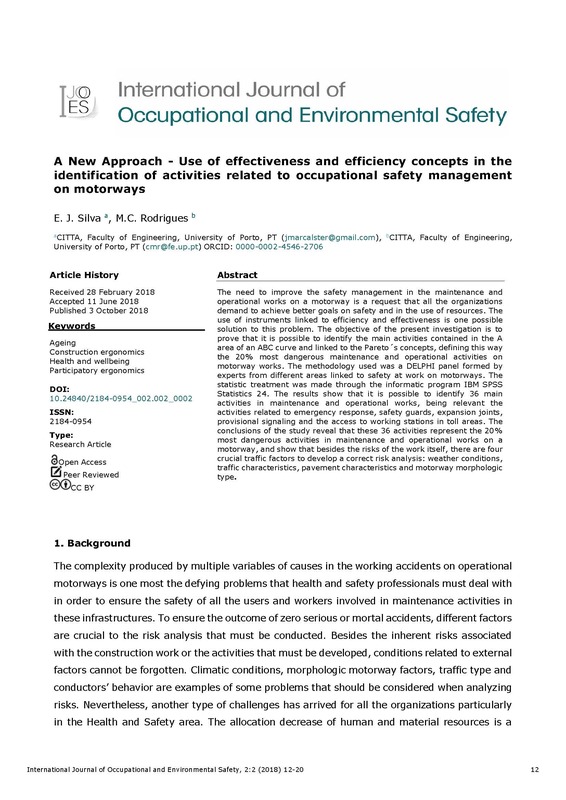 The objective of this research is to examine the influence of the factor 'organisation of the working time' upon the occupational accidents in enterprises as well as to suggest a model of an impact mechanism of working time organization on the occurrence and prevention of accidents/near accidents, using a representative Bulgarian sample. The research is based on a survey conducted in 2016 among 410 employees (52.9% women; 47.1% men) from all economic sectors. Statistical processing and analysis are performed by SPSS/PSPP and statistical modeling by EViews/Gretl. Results show that approximately every fifth employee works longer than the standard weekly occupation of 40 hours; 17.1% of all suffered work-related accident(s); 36.2% work overtime and 41.1% recognize the presence of work-related health problems (most common are total fatigue, back pain, stress and headache). Among those respondents claiming to have work-related health problems, accidents at work occur most frequently when working over 40 h/week. 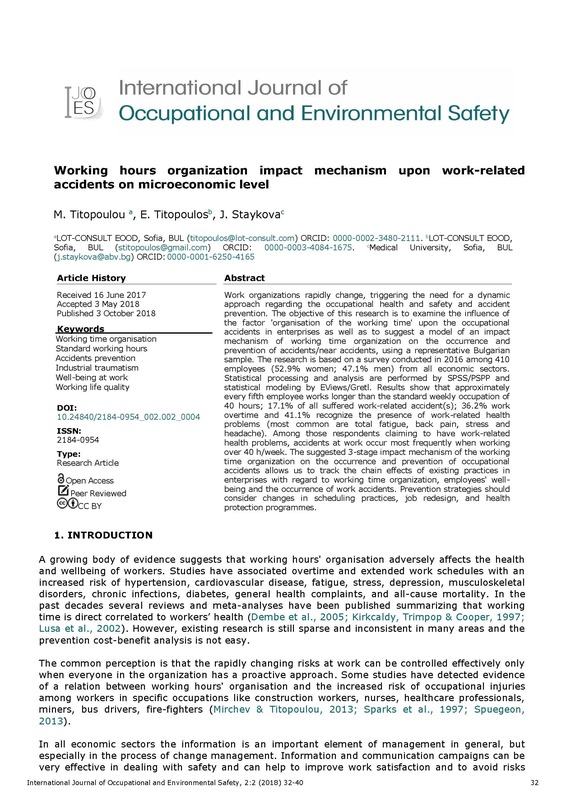 The suggested 3-stage impact mechanism of the working time organization on the occurrence and prevention of occupational accidents allows us to track the chain effects of existing practices in enterprises with regard to working time organization, employees' well-being and the occurrence of work accidents. Prevention strategies should consider changes in scheduling practices, job redesign, and health protection programmes. Musculoskeletal disorders (MSDs) have been identified as a predisposing factor for lesser productivity and are considered to be a major occupational health problem contributing significantly to absenteeism, disability and loss of productivity. Computer users may develop musculoskeletal disorders due to the forces applied, muscle use, posture and wrist velocity and acceleration exposures during computer use. Work-related musculoskeletal disorders (WMSDs) in computer users cause substantial worker discomfort, disability and loss of productivity. 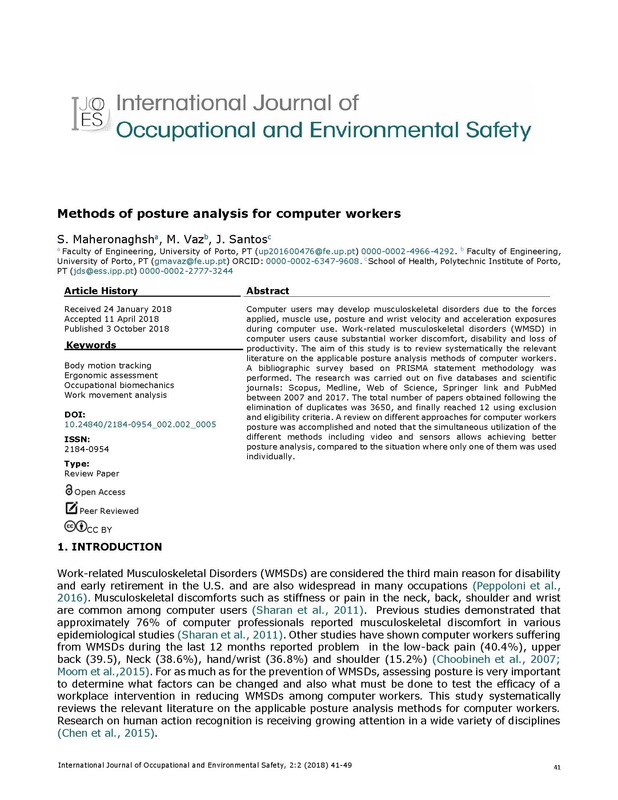 The aim of this study is to review systematically the relevant literature on applicable posture analysis methods to computer workers. A bibliographic survey based on PRISMA statement methodology was performed. A review on different approaches for computer workers posture was accomplished and noted that the simultaneous utilization of the different methods allows achieving better posture analysis, compared to situations when each one of them was used individually. Scope & Goals: This article presents a coupled review of scientific literature on environmental impact, as well as occupational safety and health, of gasification plants using residues of sewage sludge and refuse-derived fuel. Methods: The survey, covering a 10-year time span, was made through a typical systematic review of literature, retrieved from online databases of scientific publications and by using general search engines; cross-referencing of citations included in documents were also considered. Results: Two tables summarizing 38 publications were created, indicating relevant studies on the matter(s), and providing a short description on risks, goals and main findings of each study, followed by a general discussion. 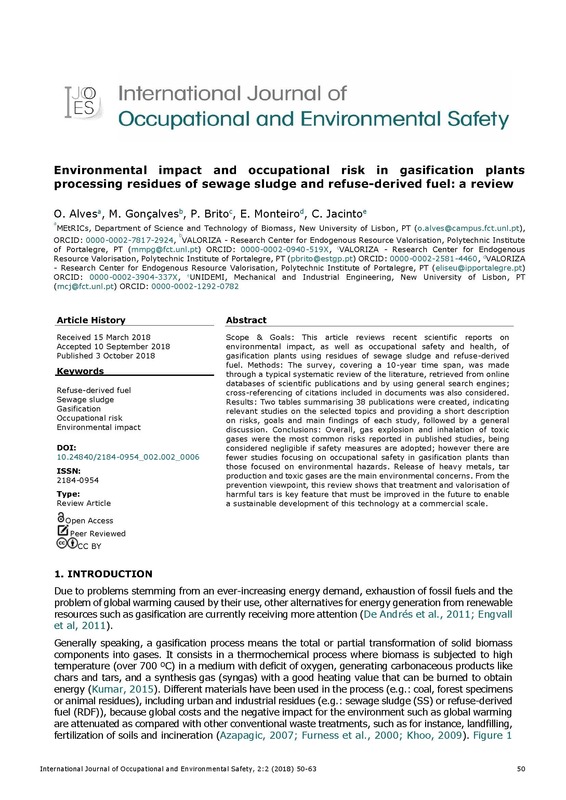 Conclusions: Overall, gas explosion and inhalation of toxic gases were the most common risks reported in published studies, being considered negligible if safety measures are adopted; however there are fewer studies focusing on occupational safety in gasification plants as compared with the environmental issue. Release of heavy metals, tar production and toxic gases are the main environmental concerns. From the prevention viewpoint, this review shows that treatment and valorisation of harmful tars must be improved in future technological and scientific developments. 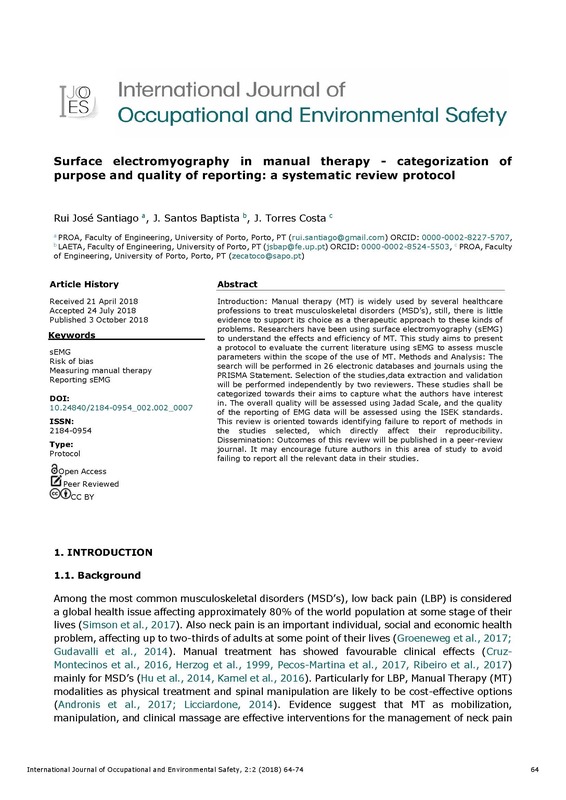 Introduction: Manual therapy (MT) is widely used by several healthcare professions to treat musculoskeletal disorders (MSD’s), still, there isn’t enough evidence to support its choice a therapeutic approach to these disorders. Researchers have been using surface electromyography (sEMG) to understand the effects and efficiency of MT. This study aims to evaluate the current literature using sEMG to assess muscle parameters within the scope of the use of MT. Methods and Analysis: The search will be performed in 26 electronic databases and journals using the PRISMA Statement. Selection of the studies, data extraction and validation will be performed independently by two reviewers. These studies shall be categorized towards their aims to capture what the authors have been interest in. The overall quality will be assessed using Jadad Scale and the quality of the reporting of EMG data will be assessed using the ISEK standards. This review is oriented toward identifying failure to report of methods in the studies selected, which directly affect their reproducibility. Dissemination: Outcomes of this review will be published in a peer-review journal. It may encourage future authors in this area of study to avoid failing to report all the relevant data in their studies. During military operations, soldiers often encounter extreme environmental, metabolic and neuropsychiatric conditions, which combined lead to a fatigue status that can cause serious physiological impairments, decreasing military performance on the battlefield. Comprehensive studies in realistically stressful environments are essential to expand the knowledge regarding the consequences of real-life stress exposure, facilitate development of operationally-useful techniques and promote the conception of improved treatments. 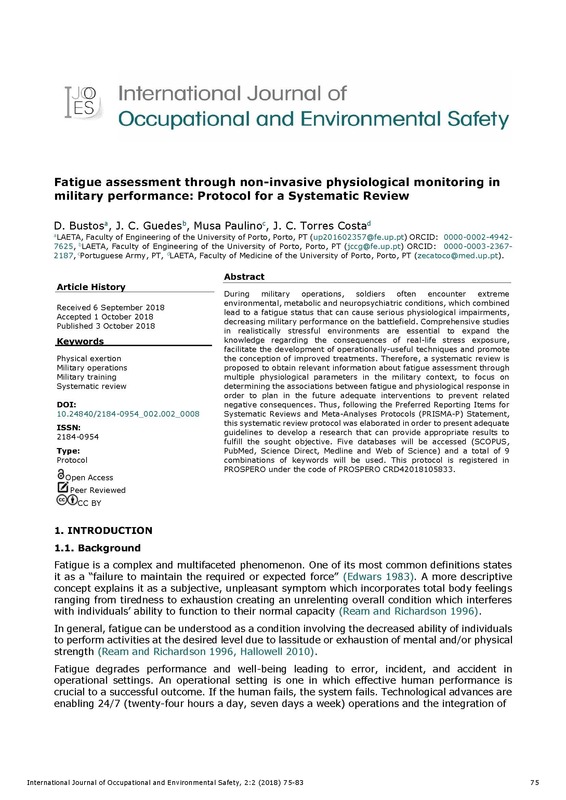 Therefore, a systematic review is proposed to obtain relevant information about fatigue assessment through multiple physiological parameters in the military context, to focus on determining the associations between fatigue and physiological response in order to plan in the future adequate interventions to prevent related negative consequences. Thus, following the Preferred Reporting Items for Systematic Reviews and Meta-Analyses Protocols (PRISMA-P) Statement, this systematic review protocol was elaborated in order to present adequate guidelines to develop a research that can provide appropriate results to fulfil the sought objective. Five databases will be accessed (SCOPUS, PubMed, Science Direct, Medline and Web of Science) and a total of 9 combinations of keywords will be used. This protocol is registered in PROSPERO under the code of PROSPERO CRD42018105833. Mining industry due to its great technical challenges continues to be one of the main high-risk industries. Many features can be attributed to this issue, such as worker’s age and experience, but also to environmental factors as well as equipment failure and misuse. 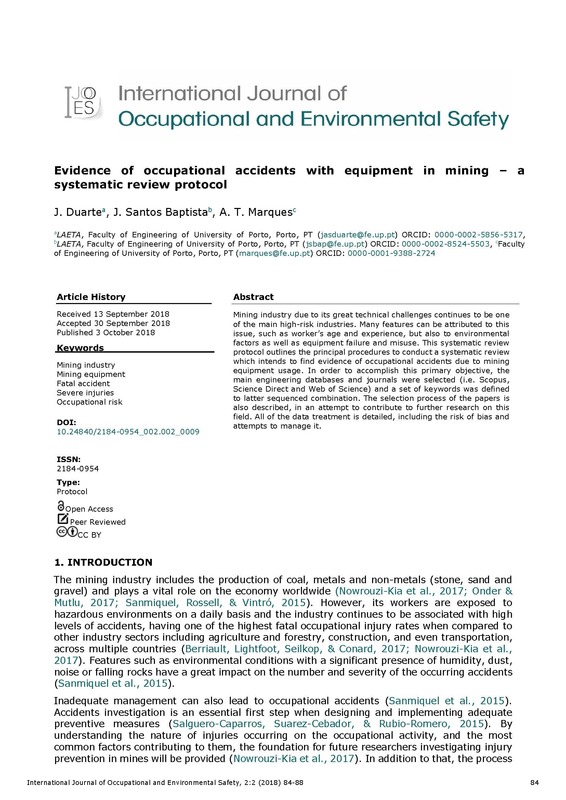 This systematic review protocol outlines the principal procedures to conduct a systematic review which intends to find evidence of occupational accidents due to mining equipment usage. In order to accomplish this primary objective, the main engineering databases and journals were selected (i.e. Scopus, Science Direct and Web of Science) and a set of keywords was defined to latter sequenced combination. The selection process of the papers is also described, in an attempt to contribute to further research on this field. All of the data treatment is detailed, including the risk of bias and attempts to manage it.